Solid State Polymerization (SSP)is an indispensable tool in the design, manufacture, and study of polymers, plastics, and fibers. SSP presents significant advantages over other polymerization techniques due to low operating temperatures, inexpensive equipment, and simple and environmentally sound procedures. Combining fundamentals of polymer science, chemistry, physical chemistry, and engineering, SSP also offers many research applications for a wide range of students and investigators. Solid State Polymerization provides the most up-to-date coverage of this constantly developing field to academic and industry professionals, as well as graduate and postgraduate-level students in chemical engineering, materials science and engineering, polymer chemistry, polymer processing and polymer engineering. Constantine D. Papaspyrides is Professor and Director of the Laboratory of Polymer Technology in the School of Chemical Engineering at the National Technical University of Athens, Greece. He has been ex-President of the School and Visiting Professor/Consultant in Massachusetts Institute of Technology (MIT), Eidgenssische Technische Hochschule Zrich (ETH), E.I. du Pont de Nemours & Company, Inc. / Invista, Inc., and Ciba Lampertheim GmbH. He serves on the editorial board for the journals Advances in Polymer Technology Journal (Wiley) and Progress in Rubber, Plastics and Recycling Technology Journal (Rapra Technology). Stamatina N. Vouyiouka is elected Lecturer in the School of Chemical Engineering at the National Technical University of Athens in Greece. 1 Fundamentals of Solid State Polymerization (C. D. Papaspyrides and S. N. Vouyiouka). 1.2 Solid State Polymerization of Chain-Growth Polymers (Solid State Polyaddition). 1.3 Solid State Polymerization of Step-Growth Polymers (Solid State Polycondensation). 1.4 Solid State Polymerization Apparatus and Assemblies. 1.5 Solid State Applications in the Polymer Industry. 2 Solid State Polymerization Chemistry and Mechanisms: Unequal Reactivity of End Groups (Haibing Zhang and Saleh A. Jabarin). 2.2 Special Characteristics of Solid State Polymerization. 2.3 Classical Kinetic Equations in Solid State Polymerization. 2.4 Model of Molecular Morphology and Chain-End Movement. 2.5 Reactivity of End Groups. 2.6 Why Intrinsic Viscosity Levels Off During Solid State Polymerization. 2.7 Solid State Polymerization Kinetics. 3 Kinetic Aspects of Polyester Solid State Polymerization (F. Pilati and M. Toselli). 3.2 Phenomena Involved in Solid State Polymerization of Polyesters. 3.3 Modeling Solid State Polymerization of Polyesters. 3.4 Solid State Polymerization of Typical Polyesters. 4 Kinetic Aspects of Polyamide Solid State Polymerization (S. N. Vouyiouka and C. D. Papaspyrides). 4.2 Simple Kinetic Models of Solid State Polyamidation. 4.3 Simulation of Solid State Polyamidation. 4.4 Simple SSP Kinetics: The Case of Poly(hexamethylene adipamide). 5 Catalysis in Solid State Polymerization Processes (Rudolf Pfaendner). 5.2 Catalysts in Polyester Solid State Polymerization Processes. 5.3 Catalysts in Polyamide Solid State Polymerization Processes. 5.4 Reactive Additives in Solid State Polymerization Processes. 5.5 Inert Additives in Solid State Polymerization Processes. 6 High-Pressure Solid State Polymerization of Polyamide Monomer Crystals (Tokimitsu Ikawa). 6.2 High-Pressure Solid State Polymerization. 6.2.1 Crystals and Characteristics of Monomers. 6.3 Polymerizability and Structure Formation. 7 Fundamental Process Modeling and Product Design for the Solid State Polymerization of Polyamide 6 and Poly(ethylene terephthalate) (Kevin C. Seavey and Y. A. Liu). 7.2 Solid State Polymerization Modeling Guide. 7.3 Fundamentals of Solid State Polymerization Reactors. 7.5 Example Simulation and Application. 7.6 Modifications to Account for Crystallization. 8 Recent Developments in Solid State Polymerization of Poly(ethylene terephthalate) (S. A. Wadekar, U. S. Agarwal, W. H. Boon, and V. M. Nadkarni). 8.2 Conventional Solid State Polymerization Processes. 8.3 New Solid State Polymerization Processes. 8.4 Poly(ethylene terephthalate) Flake Recycling Using Solid State Polymerization. 8.6 Alternatives to Solid State Polymerization. 8.7 Poly(ethylene terephthalate) for Fluid Packaging Applications. 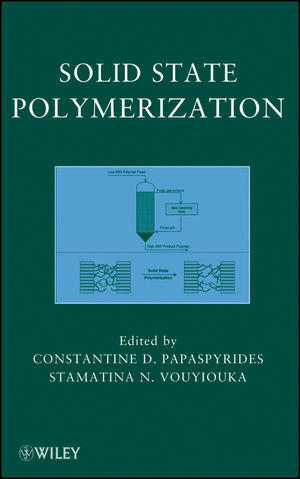 "Solid State Polymerization provides a solid overview over the entire field of industrial condensation polymers particularly polyamides and polyesters, and researchers and engineers will find relevant knowledge to develop polmerization reactors and design pertinent plants in the solid state." (Plastics Engineering, 15 November 2010).